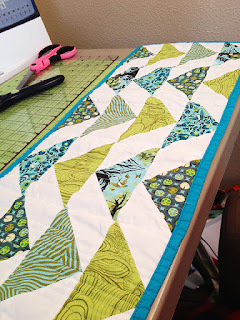 FabricLovers Blog: Friday Favorites: Baby projects, found blogs, and a no-sew project! Friday Favorites: Baby projects, found blogs, and a no-sew project! It's Friday! I can now sit down and finish my quilt, hopefully. All I have left to do is the binding and although the overall quilt didn't come out as amazing as I had first imagined, I love it anyway. I'll be glad to have that checked off my to-do list soon! And you guys will be able to see it in all it's glory! I also placed a little announcement this past Father's Day on Facebook. I'm expecting! We had just found out and my husband was so excited he told everyone! So I told our Facebook followers. I won't bombard you with too much about the baby only to post great DIY projects that I plan on doing, or that look just so darn cute and interesting. I hope you guys don't get too tired of it? Being so busy that I can't sit down to sew makes me sad, but I did find this lovely project that requires no sewing at all! 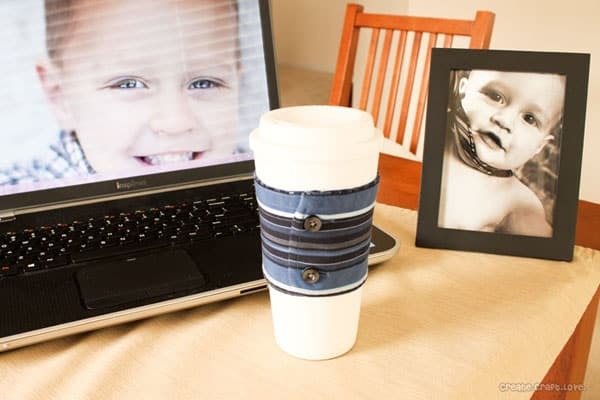 CreateCraftLove brings us this DIY tutorial for a coffee cozy where you'll never have to pick up a needle and thread! All you need to do is find an old dress shirt of a man in your life, cut off the cuff, and then slip it on your coffee cup. Done! I also found a really great blog called Domestic Deficit Disorder, which is a name that describes my life, perfectly. The link will send you to a lovely table runner. I just adore those colors and kind of wish I had thought to make that. She's having trouble with the corners though, so maybe you guys can give her some tips? I also found a way to easily personalize a burp cloth. 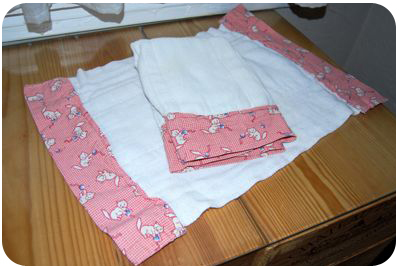 The tutorial, from the site Make Baby Stuff, would be great if I knew whether I was expecting a girl or a boy! I love it though and will definitely be putting this easy DIY on my list of things-I-hope-to-get-done-before-baby-comes! I also found this lovely tote pattern on the Fabriclovers.com site. I'd love to create one of these to go to the grocery store. I'd look chic and like I was being thoughtful about the environment! They really do look heavt duty and the wider than usual straps would likely hold up to the amount of stuff I stick in my bags. Want something to help you procrastinate? Please follow us on Twitter, Pinterest, Facebook and/or comment below on things you'd like me to feature or talk about!